WASHINGTON, DC, September 28, 2011 (ENS) – The U.S. Department of Agriculture is awarding a total of $80 million to support the expansion of the American biofuels industry. Authorized under the Bioenergy Program for Advanced Biofuels, contained in the 2008 Farm Bill, the payments will go to 163 energy producers in 41 states. The payments are based on the amount of biofuel a recipient produces from any renewable biomass, other than corn kernel starch. Eligible examples include biofuels derived from cellulose, crop residue, animal, food and yard waste material, landfill and sewage waste treatment gas, vegetable oil and animal fat. For instance, Ever Cat Fuels has been selected to receive a $98,500 contract payment to help offset the costs of producing almost 881,000 gallons of biodiesel at its plant in Isanti, Minnesota. Ever Cat is the first commercial plant designed to use the company’s patented Mcgyan process to produce biodiesel, which converts feedstock plant oils and animal fats to biodiesel in seconds. Termed the Mcgyan Process after the names of the inventors – the company’s chief science officer Clayton McNeff and two other scientists – the process retains its porous metal oxide catalyst for each use rather than consuming it, making it an “ever catalyst,” from which the company name is derived. The Mcgyan Process does not use water, sodium hydroxide or sulfuric acid in converting oil to biodiesel as do other biodiesel processes. The Mcgyan Process produces no byproducts such as glycerin or soap. McNeff says that Ever Cat is moving toward feedstock oils derived from weeds like pennycress, which can be grown in harsh soils and double-cropped by farmers to avoid displacing food production. The National Biodiesel Board on Tuesday applauded the USDA’s awards, which will help support dozens of biodiesel companies across the country. “These payments will create jobs and economic activity while helping the biodiesel industry advance new technologies and improve efficiency,” said Anne Steckel, NBB’s vice president of federal affairs. “It’s another example of this administration’s strong commitment to boosting domestic production of advanced biofuels and securing our energy future,” she said. The largest award, $9.94 million, will go to Lake Erie Biofuels, doing business as Hero BX. The company has constructed a 45 million gallon per year capacity plant on the shore of Lake Erie in Pennsylvania that is designed to produce biodiesel from vegetable oils, animal fats or a multi-feedstock blend. 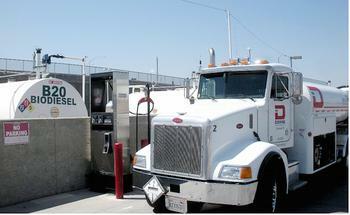 Several other large awards will go to companies that make biodiesel from waste cooking oil. Smarter Fuel, Inc. will receive $4.85 million for its biofuel production and commercial truck fleet conversion activities. “Beginning with waste vegetable oil, our proprietary refining methods produce a fuel that is comparable to #2 fuel oil,” the company says. Another large award, $2.17 million will go to Ag Processing, Inc., a regionally federated cooperative owned by 185 local cooperatives representing 250,000 farmers. The company has nine soybean processing plants and is a leading vegetable oil refiner. AGP has just doubled its capacity to 120 million gallons of biodiesel per year with the purchase of an idle biodiesel plant Algona, Iowa, giving it three biodiesel manufacturing facilities. An award of $1.5 million will go to Environmental Energy Recycling Corp., with locations in New York and Pennsylvania, which provides waste cooking oil collection and recycling for the food service industry. Nearly $1.5 million will be awarded to Sequential-Pacific Biodiesel, launched in Salem in 2005, as Oregon’s first commercial biodiesel production facility. The facility utilizes locally collected waste cooking oil and Oregon-grown canola as feedstocks to produce over 17 million gallons of biodiesel a year. Several ethanol producers will receive payments. One of the larger awards, $3.97 million, will go to White Energy, the first ethanol producer in Texas. White Energy currently operates a 100 gallon per year ethanol plant in Hereford, Texas, a 110 gallon per year ethanol plant in Plainview, Texas, and a 50 million gallon per year ethanol plant in Kansas.